You know the feeling… after a long day you come home and the first thing you do is take off your shoes. Your 5-inch high glammed red heels. Your feet full of blisters and you almost even tripped a few times. So how does that go on your wedding day? It’s the best day of your life in Miami and you want to look your best. But you absolutely don’t want to fall and walking a full day on heels doesn’t really sound like fun. If you’re on the dance floor, you want to move wildly and not be afraid to stumble. So goodbye heels and hello Converse! If you could choose between the whole day walking on heels, or soft, comfortable sneakers then the choice is quickly made for many. Are you not a fan of stiletto heels and pumps, but you still want to look nice to dance at your wedding? Sneakers are totally hip to wear, and that’s good news for all. And sneakers are also a perfect option for men who don’t want to walk around in tight dress shoes. You should fully enjoy your wedding day… and your feet should as well! No one said you can’t wear your favorite casual shoes at your wedding. Converse makes everyone feel like an All-Star. Choose the right size sneaker, decorated with your choice of name and date, or even the lyrics of your special song, to make your special day complete. 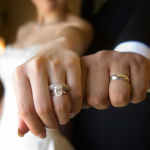 More and more brides avoid the traditional style and are choosing radical new options. The custom-made creations are ideal for brides, grooms, bridesmaids and other members of the party. Our favorite colors? ‘Peppermint and ‘Carnival Pink’. If you’re not so fond of color, then classic black is also stunning under your wedding dress. 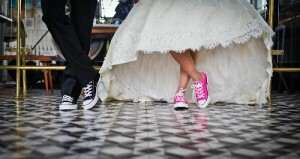 Whether you fancy high-tops or low-tops, blacks, white, red or even a pink Converse, when it comes to a personalized wedding Converse, you can choose anything! 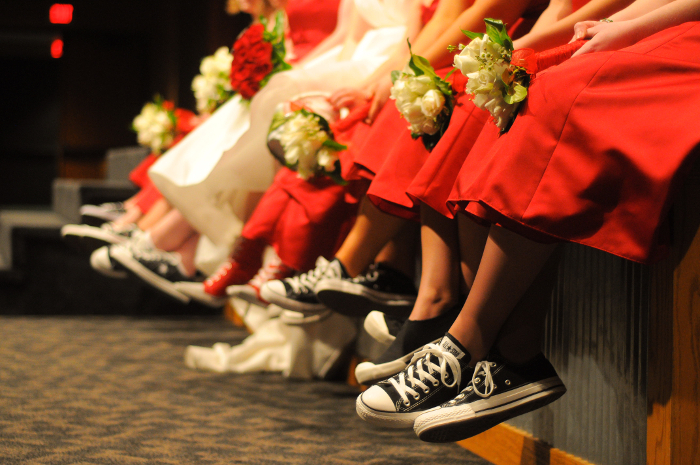 Most brides who choose to walk on bridal sneakers are looking for something different and fun. Besides the fact that it’s a playful alternative to the more traditional styles, they are also a comfortable option for brides who are not able to wear heels. The wedding Converse shoes are the forefront of the trend, offering brides a sassy alternative to towering heels and delicate flats. They are also ideal if you want to show your moves on the dance floor without having the fear of stumbling. The color choice is endless and you can customize them with any color and any combination of shoelaces. Shoes can naturally also be printed with names, messages and even miniature pictures. One of the major shortcomings of this style is that they are not the most suitable shoes for a traditional white wedding, so if you get married in a church or you have old-fashioned grandparents, you can expect raised eyebrows. But for ladies who want to dazzle guests on the dance floor, you can even decorate your shoes with glitter and crystals. Just like your love, your shoes will be unique.